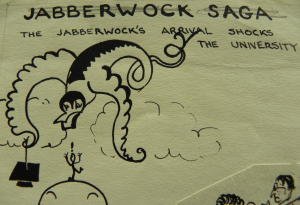 Artwork from a poster advertising a 1958 issue of ‘The Jabberwock’. Coll-1611. 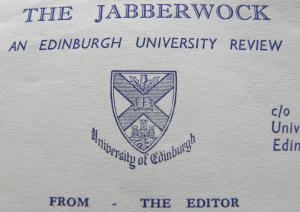 Assisted by the College, a small but interesting archive of material relating to the Edinburgh University literary review, The Jabberwock, has been acquired by the Centre for Research Collections (Special Collections) for Edinburgh University Library. Letter-heading from correspondence of the Editorial office of ‘The Jabberwock’. Coll-1611. 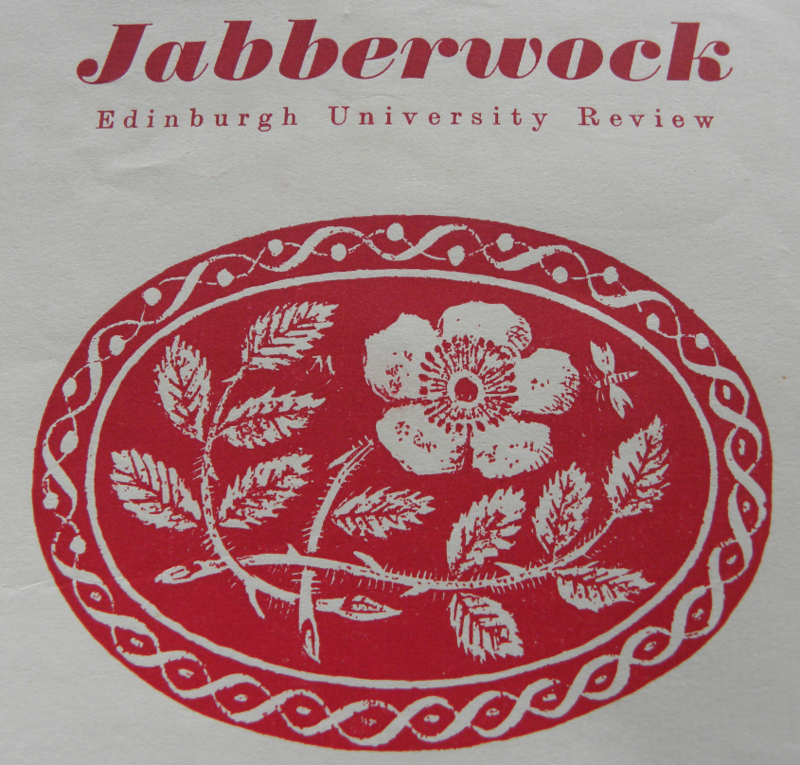 The Jabberwock was an Edinburgh University literary journal, or review, starting in the 1940s and running to the late-1950s, and its editors have included Iain Ferguson, Ian F. Holroyd, Douglas Henderson, Barbara Macintosh and Alex Neish. 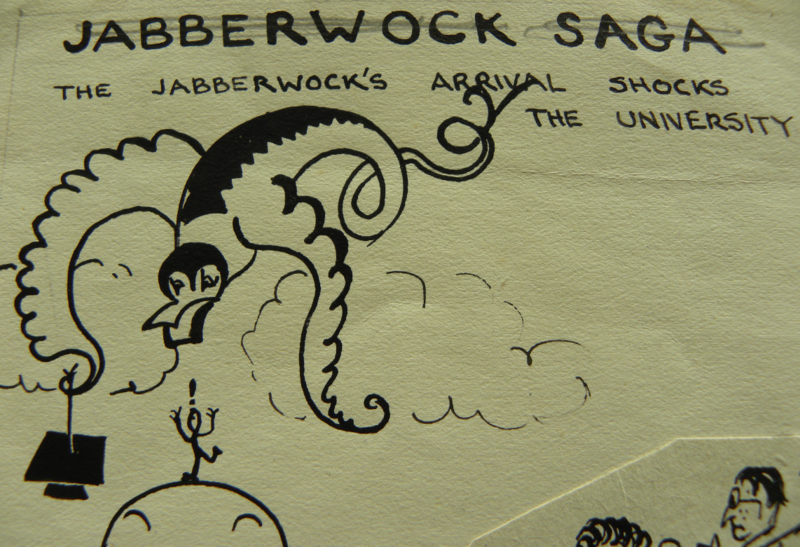 Cartoon describing the arrival of ‘The Jabberwock’, Edinburgh University. Coll-1611. The archive contains manuscript and typescript work – literary and political – submitted to the title in the 1950s under the editorship of Ian Holroyd by Scottish literary figures such as: C. M. Grieve, or Hugh MacDiarmid; Robert Garioch; Martin Gray; Sydney Goodsir Smith; Bruce Etherington; Alan Riddell; Jonathan Mills; and, other contributors. 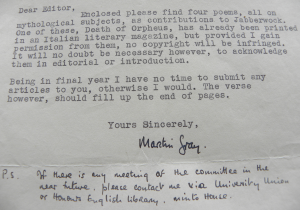 Note to the Editor of ‘The Jabberwock’ from Martin Gray telling about his submissions to the review. Coll-1611. 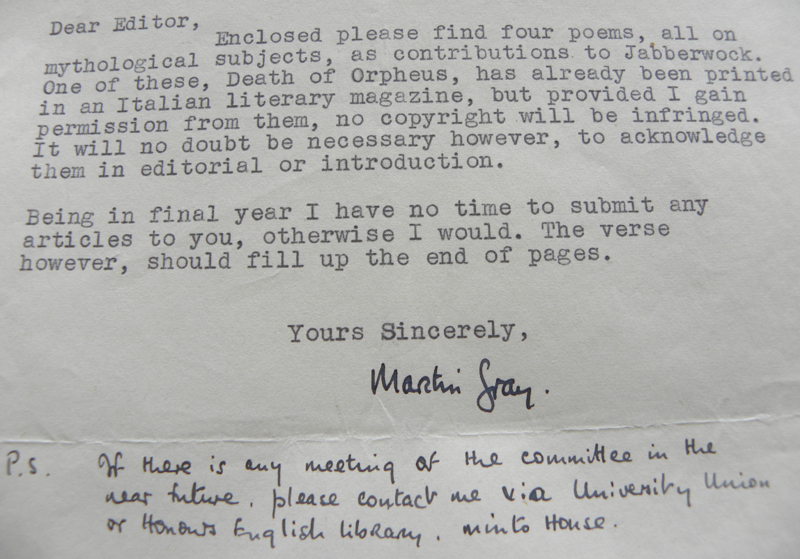 Also in the archive, there is correspondence to and from Ian F. Holroyd, posters for various editions of The Jabberwock and other printed ephemera, journal off-prints that would have assisted in the editing of some articles, scribbled accounts and sales figures, art-work, and some Jabberwock Committee Meeting minutes. 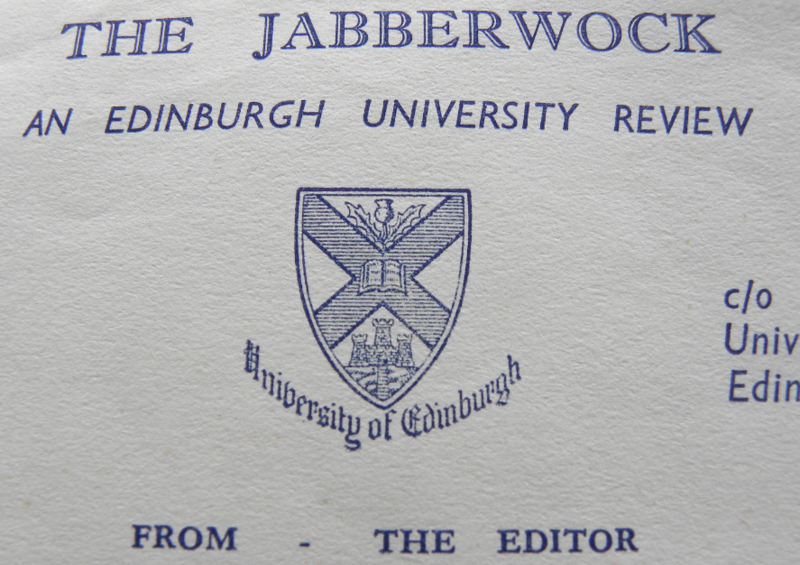 Some typed lists of Jabberwock shop sales prompt recall of Edinburgh booksellers no longer with us – Thin’s, Baxendine’s, and Bauermeister’s. Poster advertising the Volume 5. 1958 issue of ‘The Jabberwock’. Coll-1611. 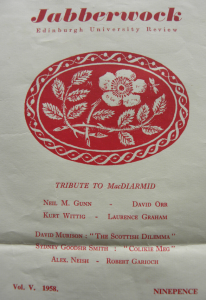 Holroyd’s correspondents include, among others: Compton Mackenzie; Sean O’Casey; C. M. Grieve or Hugh MacDiarmid; Edwin Muir; Edith Sitwell; Jonathan Mills; Neil Gunn; and, Martin Gray. 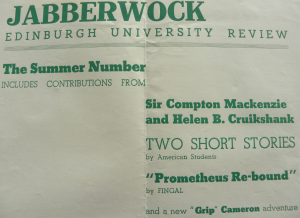 Poster for an edition of ‘The Jabberwock’ featuring contributions by Compton Mackenzie and Helen Cruickshank. Coll-1611. 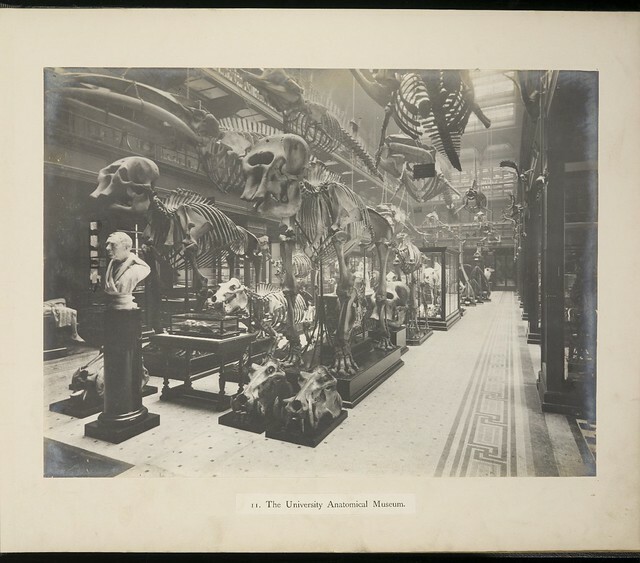 Submissions to The Jabberwock by Hugh MacDiarmid include autograph manuscripts: The Scottish Renaissance: the next step; R.B.Cunninghame Graham; and, The significance of Sydney Goodsir Smith. 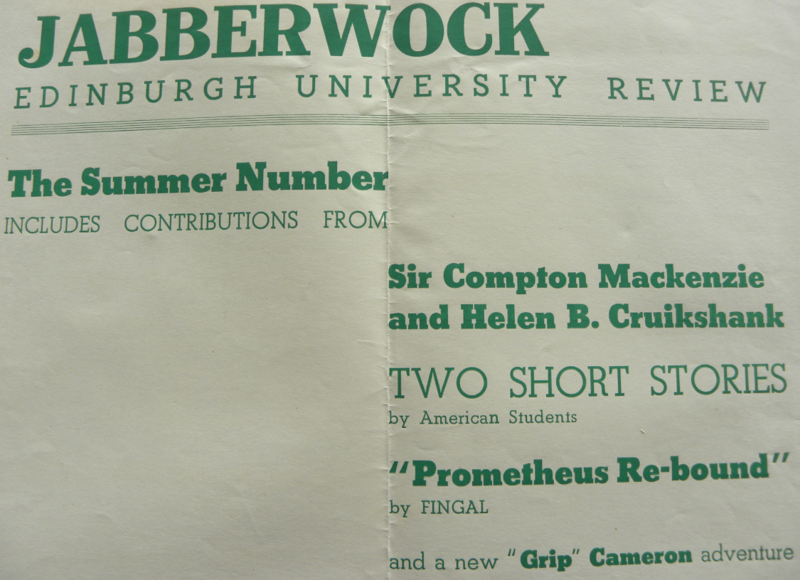 The archive holds a typescript piece by Compton Mackenzie, at the time aged 70 (so probably from 1953), in which he lauds twenty-somethings, writing ‘that the University magazine of today is a much more interesting production than it was half a century ago […] I find a magazine like Jabberwock much more lively than The Oxford Point of View. I can read it through from cover to cover with pleasure […] I am quite unable to grasp what inspires all this pessimism over modern youth’. 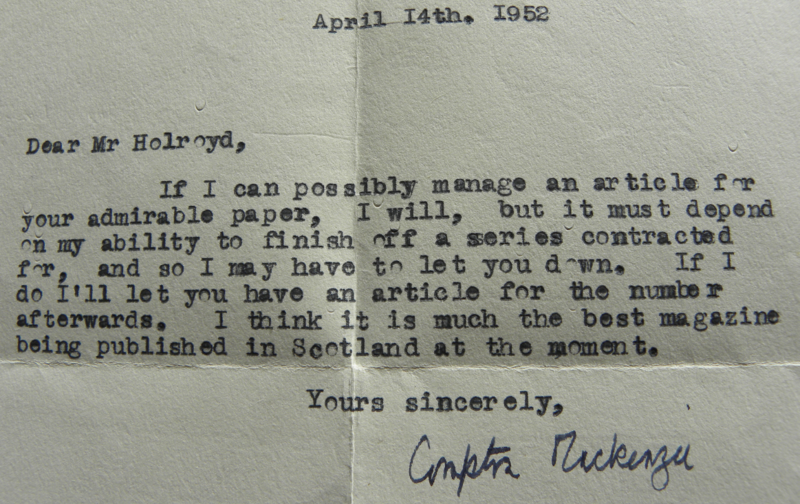 Letter dated 14 April 1952 to Ian Holroyd, Editor of ‘The Jabberwock’ from Compton Mackenzie promising a contribution. Coll-1611. 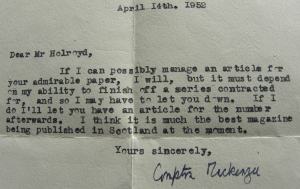 Letter dated 3 June 1952 to Ian Holroyd, Editor of ‘The Jabberwock’ from Compton Mackenzie again promising a contribution. Coll-1611. 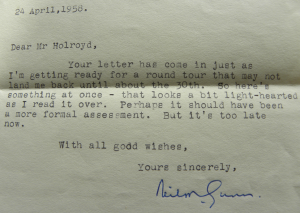 Signature of Hugh MacDiarmid (C.M.Grieve) on a letter dated 23 November 1950 to Ian Holroyd, Editor of ‘The Jabberwock’. Coll-1611. 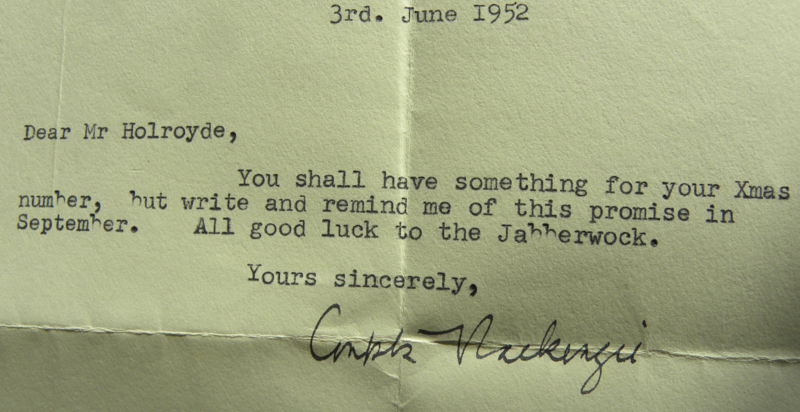 Signature of Edith Sitwell on a letter dated 23 October 1951 to Ian Holroyd, Editor of ‘The Jabberwock’. Coll-1611. 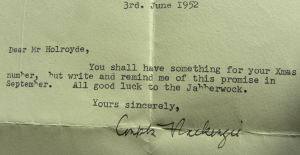 Signature of Sean O’Casey on a letter dated 24 April 1958 to Ian Holroyd, Editor of ‘The Jabberwock’. Coll-1611. 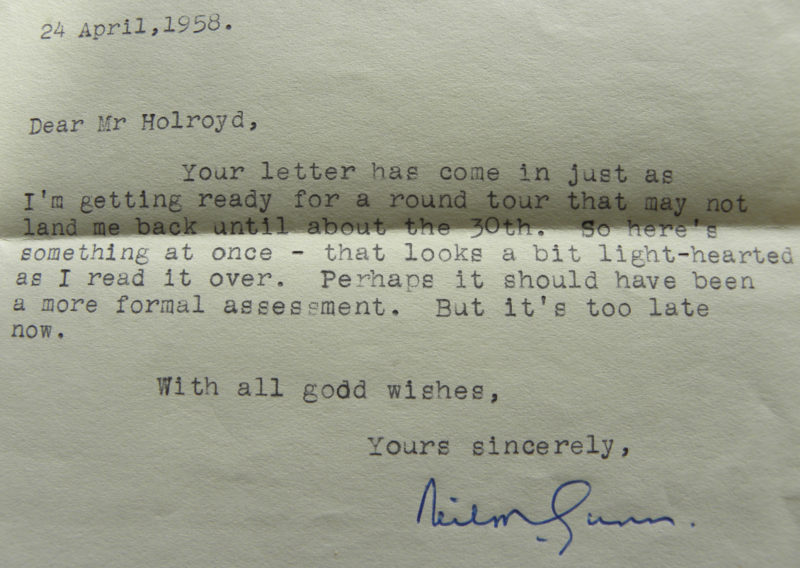 Signature of Neil Gunn on a letter dated 24 April 1958 to Ian Holroyd, Editor of ‘The Jabberwock’. Coll-1611. 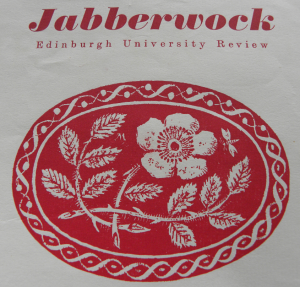 This entry was posted in Collections and tagged Edinburgh University literary review, Ian Holroyd, The Jabberwock on 17/02/2015 by eddiegd.